KABUL - Afghan security forces killed at least 99 Taliban fighters as part of five-day clearing operations in Balamorghab district of western Badghis province, the ministry of defense said Monday. Clashes between the government forces with support of foreign forces, and Taliban insurgents have not subsided even in the wake of serious talks between US peace envoy, Taliban negotiation members and in the face of forthcoming Doha talks to be held among Afghan influential figures and Taliban next week with core aim to seek a negotiated solution to end decade-old conflict in Afghanistan . 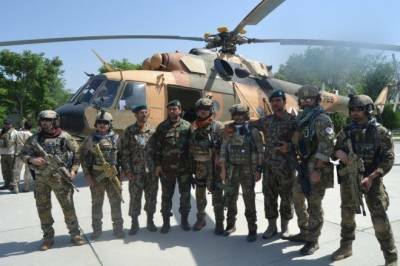 Ministry of Defense said that joint forces, Commandos, Special Forces from Police and National Directorate of Security, and Afghan Air Force have started the second phase (offensive phase) of operations in Balamorghab district of Badghis, in 99 Taliban terrorists were killed and 35 were wounded in the past 48 hours. Tactical vehicles, a large amount weapons and ammunition were seized or were destroyed in the area, the ministry said in a statement. The clearing operation continues in the district, added statement. Unfortunately, during these operations eight Afghan National Army and four Afghan National Police who fought with bravery and courage, were embraced martyrdom, the statement lamented. 10 Afghan National Army soldiers and 24 Police have also sustained injuries during clashes.